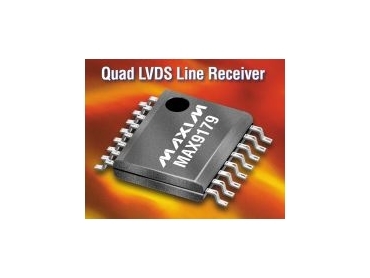 MAXIM Integrated Products, represented by Arrow Electronics , has introduced the MAX9179, a quad, low-voltage differential signaling (LVDS) line receiver with flow-through pinout. It accepts four LVDS input signals conforming to the ANSI TIA/EIA-644 LVDS standard, and translates them to low-voltage LVTTL/LVCMOS output levels. The MAX9179 input has 50mV hysteresis to eliminate unwanted switching at the output due to input noise. Flow-through pinout simplifies PC board layout and reduces crosstalk by separating the inputs and outputs. This device is ideal for applications requiring high data rates, low power, and low noise. Applications include digital copiers, laser printers, cell-phone base stations, telecom switches, and network switches/routers. Two LVTTL/LVCMOS inputs, EN and EN-bar, set all four outputs to a high-impedance state and reduce power consumption to only 33mW (typ). The enables inputs, common to all four transmitters, tolerate Vcc + 1.0V and provide GND -1.0V overshoot and undershoot protection. The inputs and output meet the IEC61000-4-2 Level 4 ESD spec, ±15kV for air gap discharge and ±8kV contact discharge. The MAX9179 operates from a 3.3V single supply, and is specified for the -40°C to +85°C temperature range. It is available in a 16-pin TSSOP package-a pin-compatible upgrade to the National Semiconductor DS90LV048-and space-saving QFN package.